The human knee must support a considerable load. It is the biggest joint in our body, involved in practically every movement we make. It is constantly subjected to pressure and tension. During our daily activities such as going up the stairs, the joint supports a load much greater than the normal one. A bent knee must support a load equal to 7.5 times body weight. The knee joint connects the femur to the tibia. The extremities of these two bones, which are set against each other, are covered by a thick layer of cartilage. Inside, interposed between the tibia and the femur, are two small crescent fibrocartilaginous discs: the internal and external menisci. The menisci move with every movement we make and they cushion shock. To prevent dislocation, the knee is kept together by robust ligaments; the crossed ligaments and the lateral ones. A joint capsule encloses the knee and helps to maintain its stability. The internal covering of the joint capsule produces a viscous fluid known as the “synovial fluid”. This nourishes the joint cartilage and preserves its elasticity. In this way, movement is smooth and not painful. Joint problems are one of the main causes of illness. X-rays in 20-40% of people in their 60s show signs of arthritis. About a third of these complain of pain. 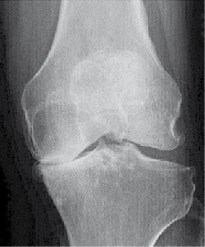 Knee arthritis is one of the most common joint pathologies. Arthritis is the gradual wear and tear of the joint surfaces, that is to say, the cartilaginous layer that protects the joint is destroyed and can no longer cushion the strain imposed on it. The bones rub together within the joint, wearing away and becoming deformed. The result is intense pain which is initially felt only after a certain amount of physical exercise, but, as the disease progresses, the pain is felt more frequently, until is arises even when resting. At the end stages, most patients complain of constant pain. The causes of arthritis in most cases are unknown. However, the factors and diseases which promote the onset of arthritis are known. The main causes are age and the natural deterioration of the joints over the years. With age, the skeleton weakens and degenerates. However, bad posture and excessive strain are additional risk factors, as are X or Y shaped legs, lack of exercise and obesity. Potential predisposing factors are: joint inflammation, caused by rheumatic or metabolic diseases. Accidents and injuries can also be responsible for joint degeneration. Sudden twisting can cause injury to the knee. For this reason, accidents occurring during skiing, rollerblading, tennis and football can be risky for the knee, ligaments and menisci. The cartilage which protects the joint can also be damaged during the accident, as a consequence of other injuries or due to excessive strain or overloading. 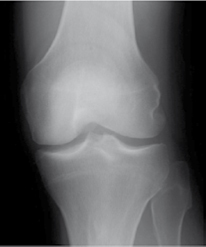 The pathological alterations of the knee joint are generally visible from X-rays. X-rays make the radiographic film turn black. The different levels of absorption of radiation by the tissues produces a natural contrast. The soft tissues such as muscles, tendons and fatty tissue absorb very little radiation and therefore are not seen. The bones on the other hand absorb a lot of radiation and they create white shadows on the radiographic film. In the case of arthritis, the destroyed cartilage is not visible. However, the orthopaedic surgeon is able to identify the loss of cartilage due to the distance between the tips of the joint. The bones, bony deformities and bone growth can be used to indicate the stage of the arthritis. During a CT scan, X-rays are recorded by various detectors. A comparison of the rays measured and emitted provides information on the tissue under examination. Using this information, the computer produces sectioned images. The tissues adopt different tones of grey which can be distinguished from each other. A CT scan clearly shows bone damage and also identifies the soft tissues such as the muscles and cartilage. Magnetic resonance imaging (or magnetic resonance tomography) does not use X-rays, but magnetic fields. The human body is composed of numerous biological magnets. An MRI scan is able to measure when, where and which type of energy is emitted by the organism and it converts this information into sectional images. The structures of the internal part of the joint, such as the cartilage and ligaments, are clearly visible with this scan but cannot be seen on X-rays or on a CT scan.